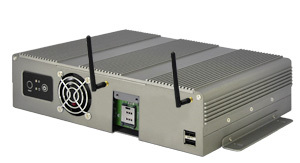 Compliant with industrial grade, Winmate 3G BOX PC series is designed for wireless control application like home automation, digital signage, surveillance systems ,and industrial automation. Winmate 3G Box PC series include 3 platforms. For the purpose of lower power consumption, IA70SB7-101-3G, which uses Intel Atom N270 processor, will be a nice solution. Regarding higher performance, customers can be satisfied from I771SB7-111-3G (Intel GM45), and A370SB7-111-3G (AMD AM3). Each Box PC is equipped with USB 2.0, RS232, PS/2, and Dual Giga LAN port that offer flexible IO for user. In addition, optional Wi-Fi module combines built-in 3G module can provide wider wireless Solution.